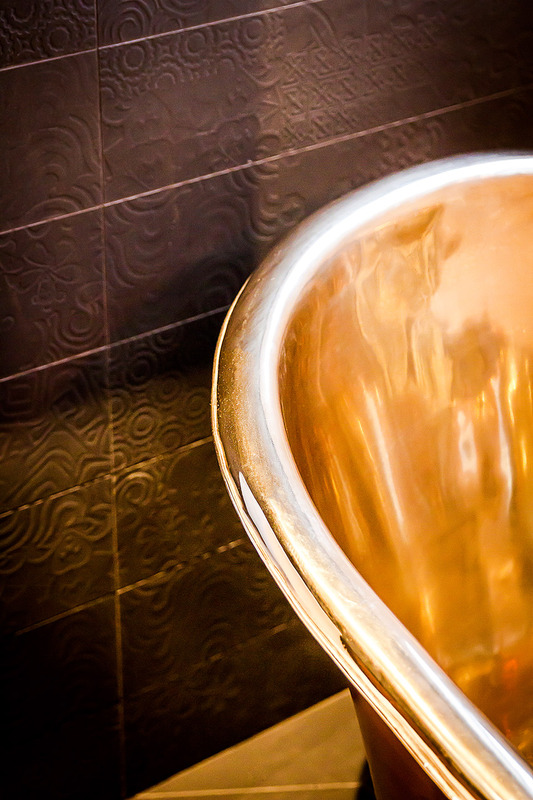 This bathroom was a beautiful gift from one gentleman to his lady and what a great present to receive. 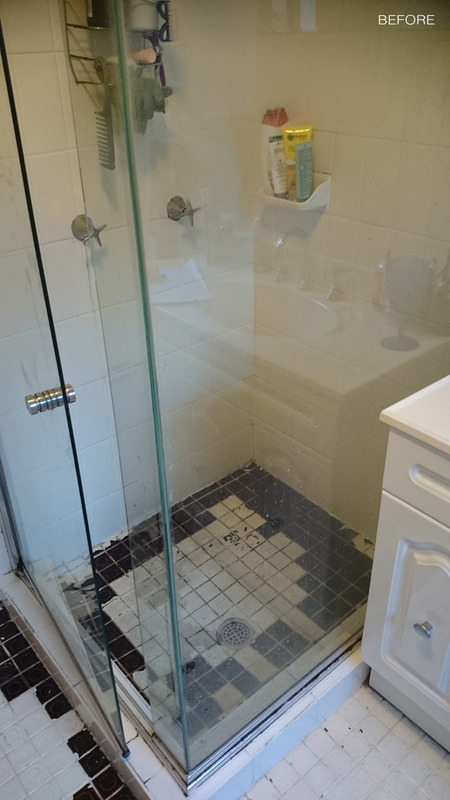 Situated within an apartment building this very outdated and dysfunctional bathroom with combined laundry was crying out for help. 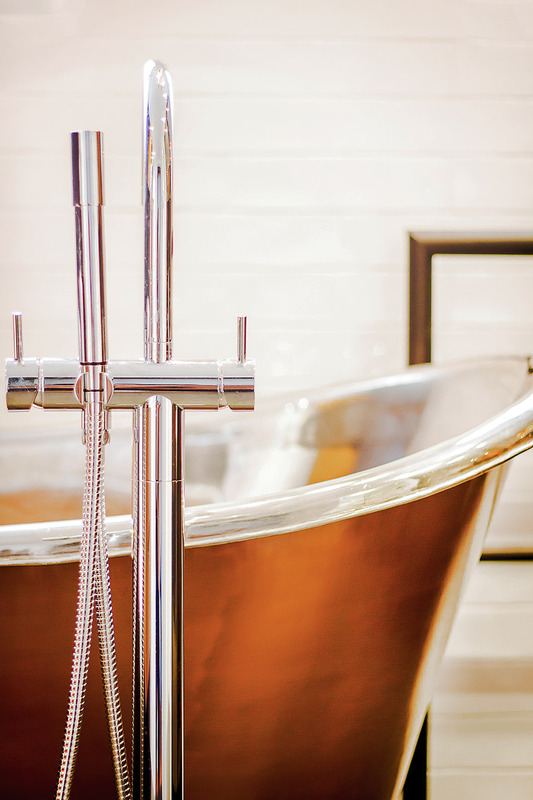 And help we did, with a lot of clever design tricks we were able to transform this once tired space into a 5 star luxury room made for relaxation.The room boasts itself of rich colours and patterns, the combination of which was meticulously put together. 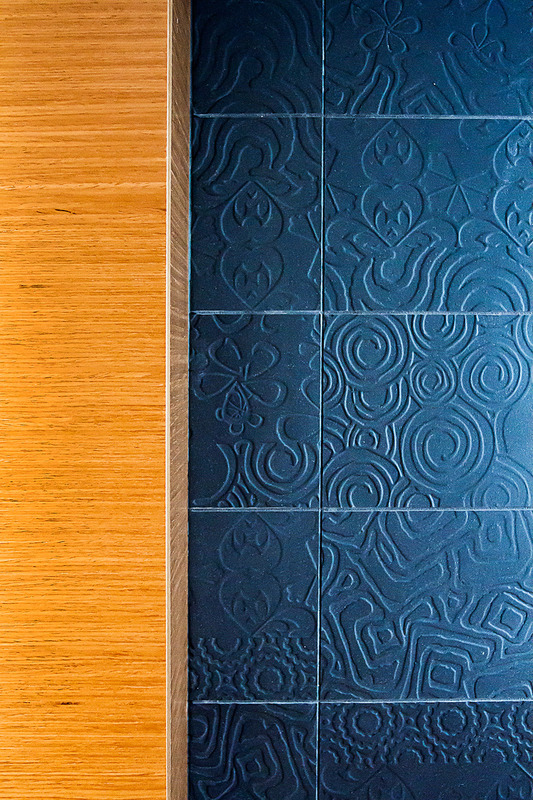 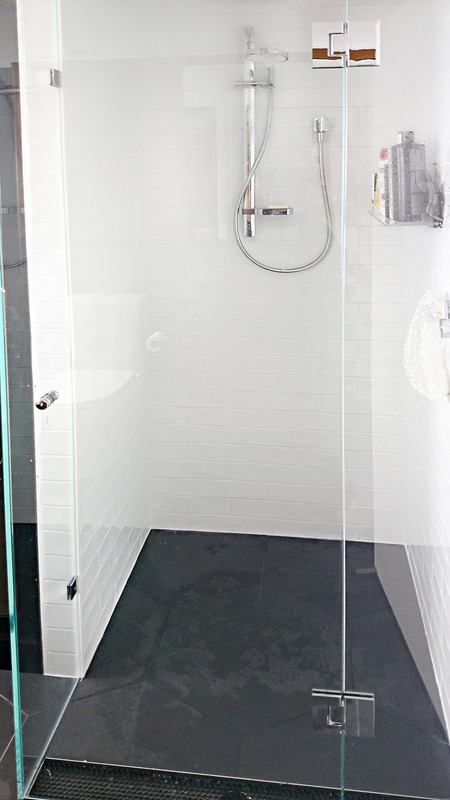 The floor tile is a modern charcoal coloured hexagonal porcelain which leads to the feature wall- an embossed patterned porcelain tile. 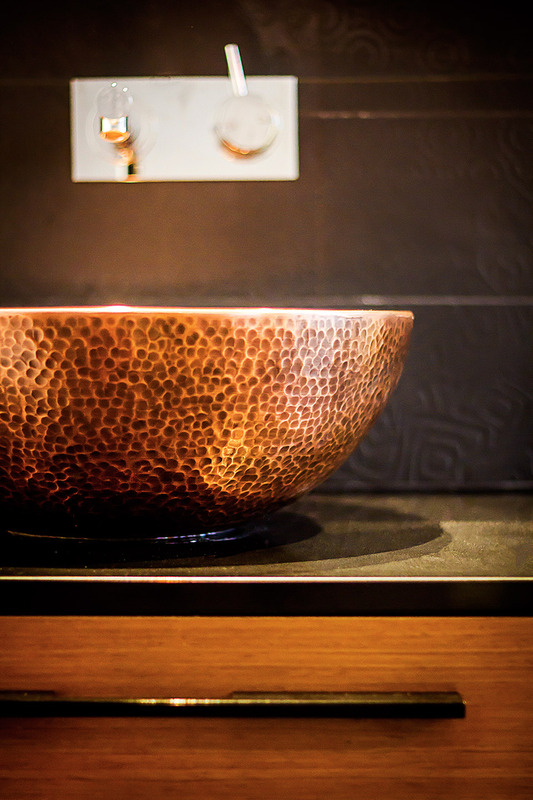 The room is then warmed with our custom designed joinery comprising of a stunning timber veneer characterised by its amber tones. 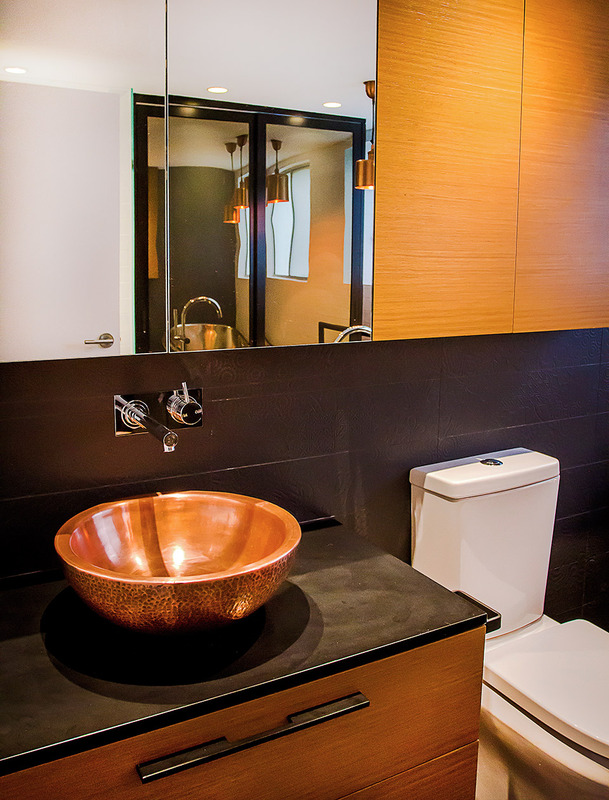 We used a lot of reflective techniques in our choice of finishes to enhance the space giving it the appeal that it’s larger than what it actually is. 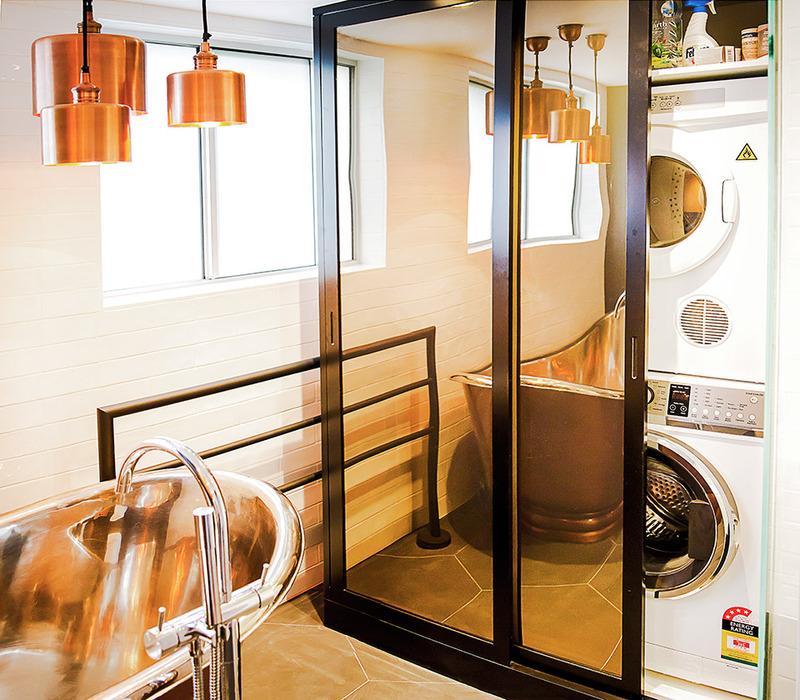 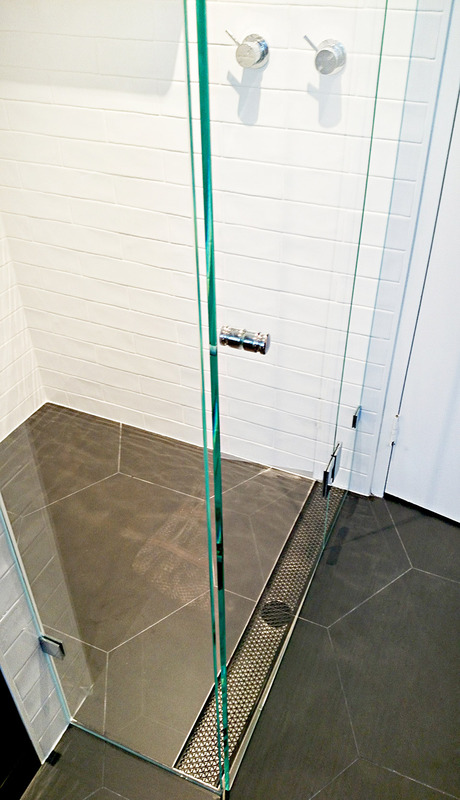 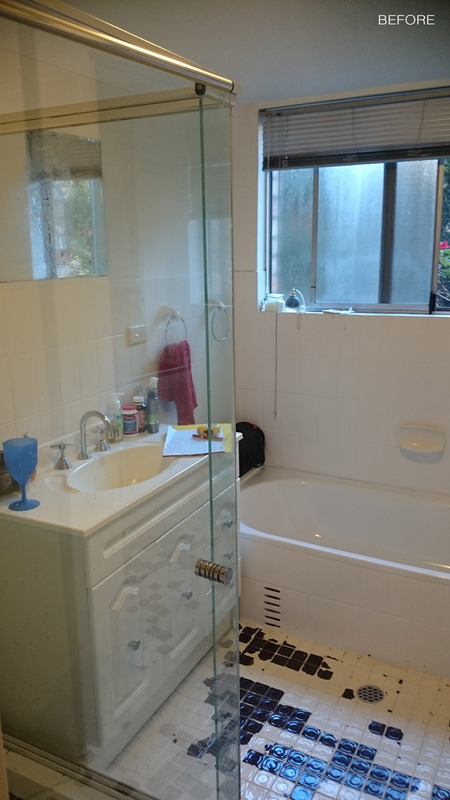 The laundry is hidden behind a custom made unit fitted with mirror acrylic sliding doors. 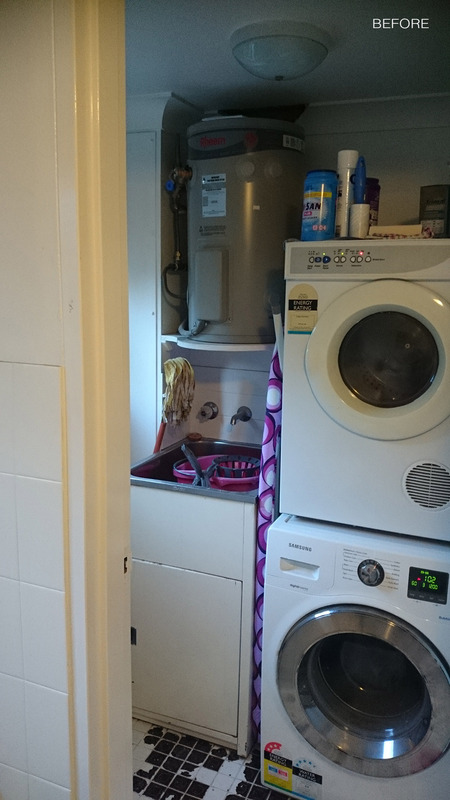 And tucked around the side is even a cat door for their pet kitty.Now do I have to point out the features of this room or have you spotted it already? 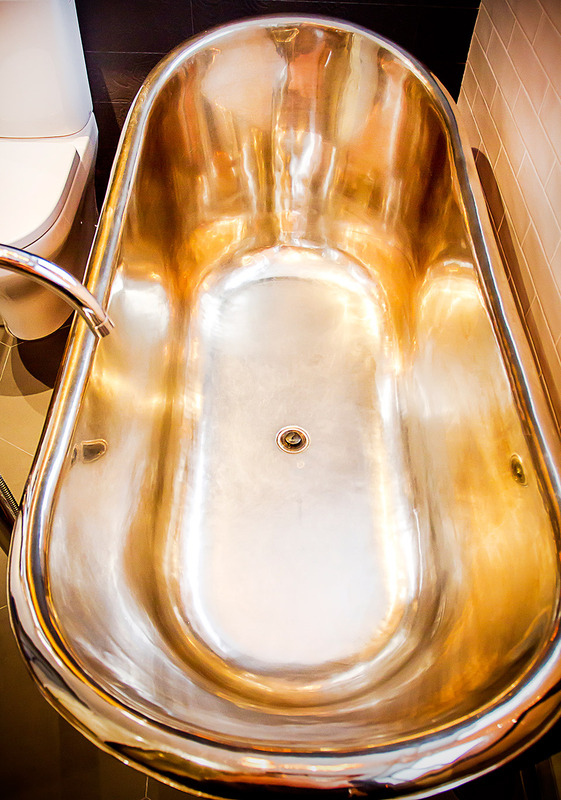 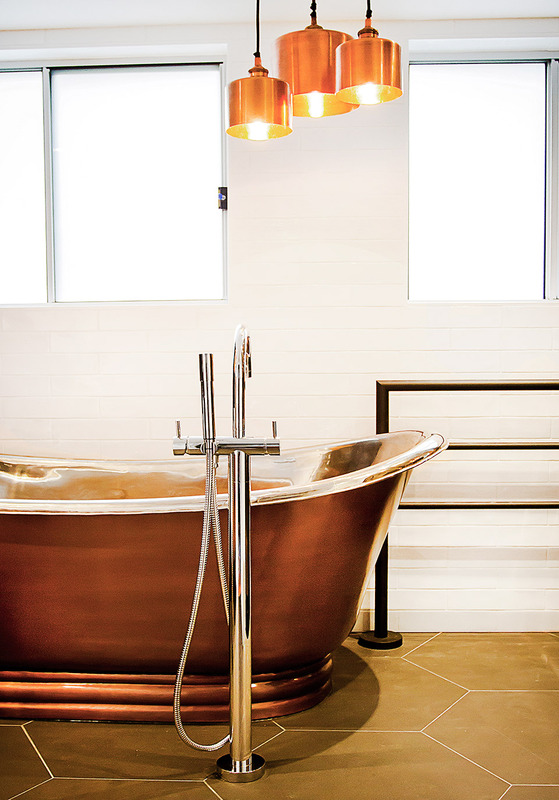 If you said the copper basin, bath and pendant lights then you’ve guessed correctly. 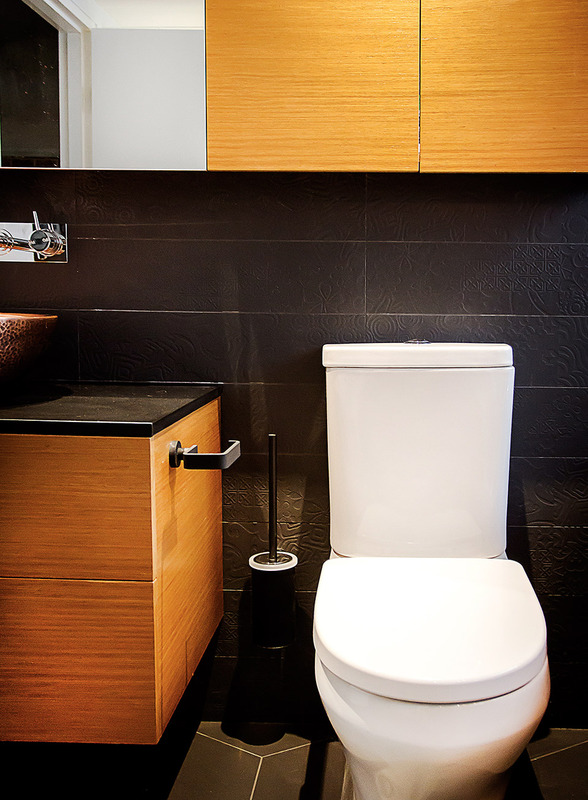 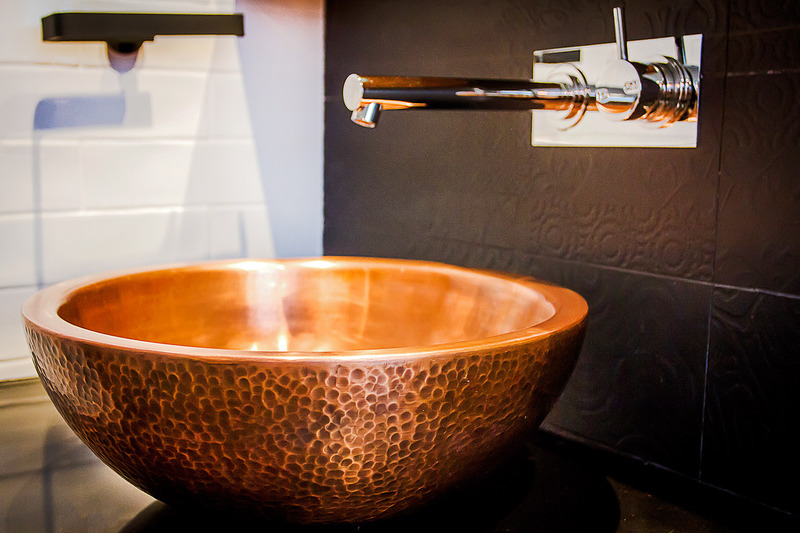 The hammered copper basin sits atop our custom stone benchtop and vanity unit. 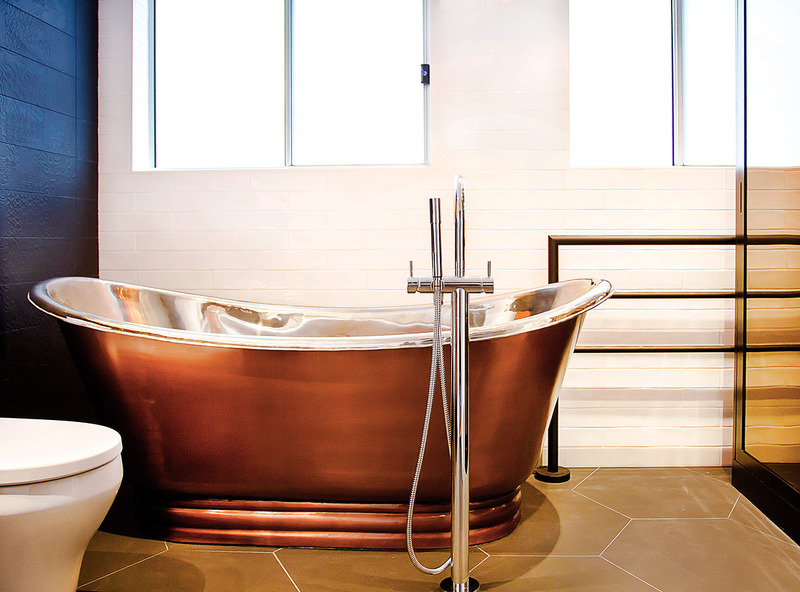 The polished copper bath jumps in contrast to the charcoal flooring. 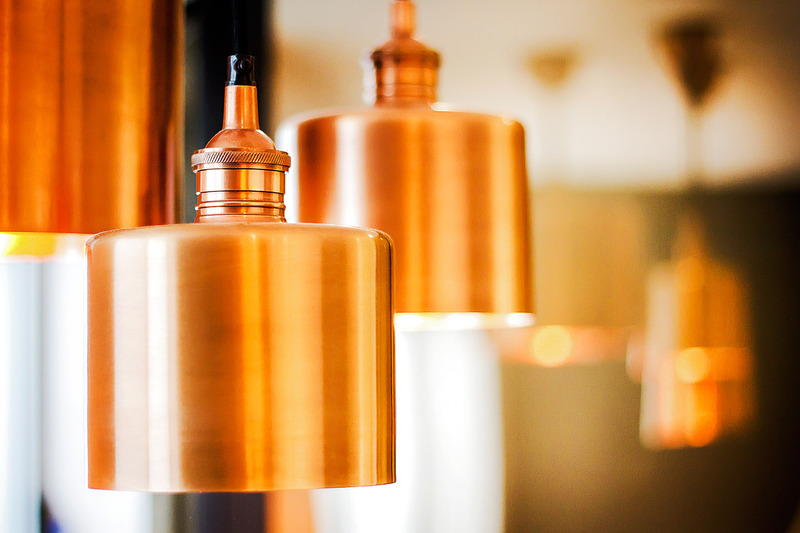 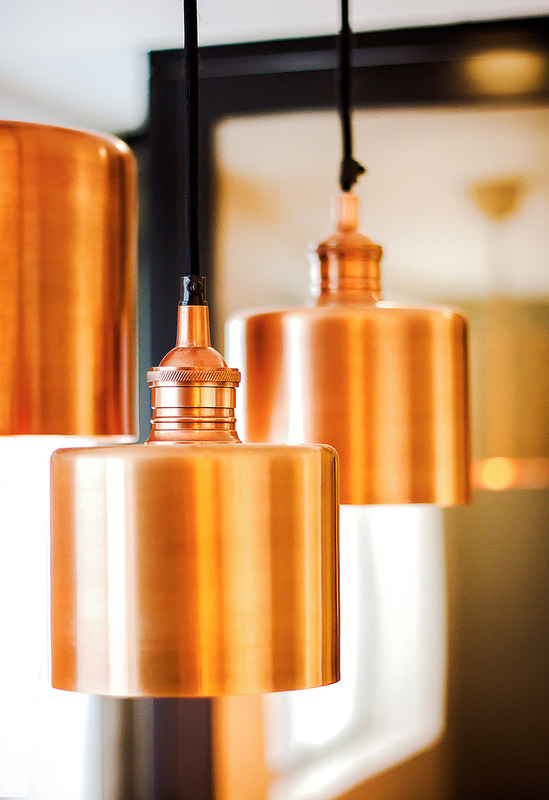 And the polished copper pendant lights add that touch of highlight at another level. 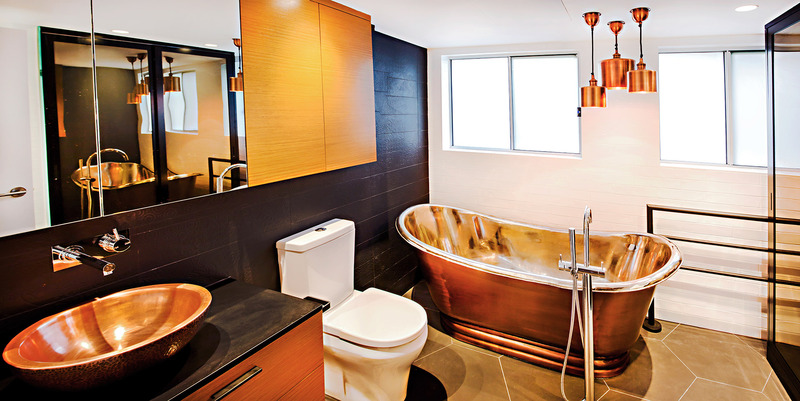 Hints of black tapware and accessories epitomise this contemporary scheme and I have no doubt that the freestanding bath will be used often.